Saturday morning finally arrives and it is time for us to say goodbye to Pavlos and Eva, and begin our voyage northward into the Cycladic islands. Pavlos drives us to the port of Iraklion to catch the ferry, talking all the while about political cronyism and the ecological damage caused by uncontrolled tourism — which is painfully evident along the coast road. Our ferry, a small high-speed catamaran, is the only one at the dock when we arrive in Iraklion. It is a surprising sight after experiencing so many crowded ferry terminals around Greece. Pavlos is able to drive right up to the gangway. The FlyingCat is impressive. Inside, it looks more like a commercial airliner than a ferry. We find our assigned seats already occupied by “squatters” trying to get a better view. They try to convince us of an open seating policy, but Duane simply shows them the seat numbers on our tickets and asks them to leave. They quickly relocate to other window seats, and are again told to vacate when the ticket-holders show up. When the ferry begins to pull away from the quay, I see the interlopers returning to their own no-view seats. As it happens, there isn’t much of a view anyway. As we leave the harbor and accelerate to full speed sea spray clouds the ports, making it difficult to see anything. It doesn’t really matter because, at a speed of 40 knots, the FlyingCat will make it a short trip. 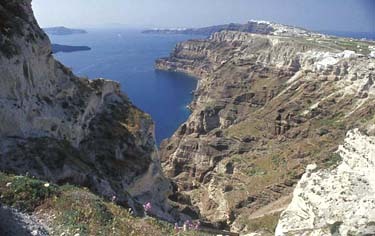 Our destination is Thera (also called Santorini), which lies about one hundred miles north of Crete. 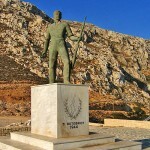 Thera is the most extraordinary island in the Aegean Sea – and the most puzzling. It is a remnant of a giant volcano that erupted thousands of years ago (around 1628 BCE), and probably contributed to the demise of the Minoan Empire. The eruption left only pieces of the original island poking out of the sea. The largest of these fragments is Thera, which you can see in the satellite photo below. Its harbor is the bowl-shaped caldera, and the tip of the submerged volcanic dome are the dark shapes offshore from the main town of Fira. These rocky outcroppings were given the name Kameni, which means “burnt.” The dome continues to grow as the volcano rebuilds itself, and its interior is still very hot. In the time before the eruption, this was a larger island called Kalliste (meaning “beautiful”). 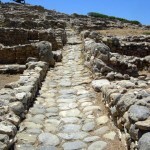 It was a prosperous Minoan trading port that welcomed merchant ships from all over the known world. 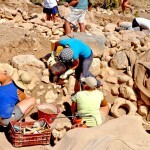 Ancient ruins, artifacts and art, uncovered over the past 30 years, confirm that a Minoan culture flourished here. The populace likely consisted of Cycladic peoples, who lived throughout the Aegean, as well as Minoans from Crete and many foreign merchants involved in trade with Crete. Volcanologists studying Thera have developed a model of how it looked like before the eruption. It was an unusual island wrapped around a huge protected harbor, in the center of which was another good-sized island. Incredibly, this central island — the volcanic dome itself — may have been entirely covered by the capitol city of the island. In Akrotiri, a town buried in volcanic ash at the southern end of Thera, archaeologists discovered a fresco that depicts ships leaving the main port city. 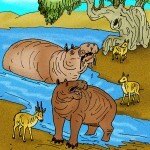 Surrounding the city is a ribbon of water (the protected harbor), beyond which are highlands with flowers and trees, and deer fleeing from a lion. Beyond the land is the sea, where dolphins frolic. This seems to fit the pre-eruption model of the island. 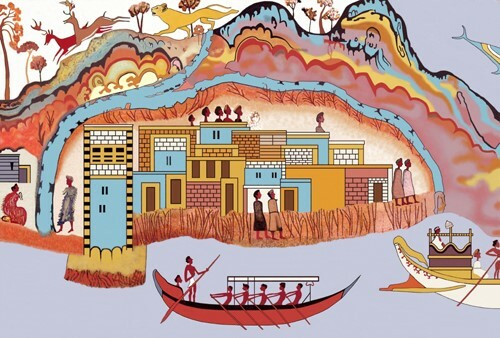 Even more intriguing, both the ancient fresco and the modern scientific model fit the description of Atlantis, one of the oldest legends of mankind. The best known version was written by Plato, the famous philosopher of Athens. He told of a divine race of people who established a rich and peaceful civilization on the wondrous island of Atlantis. After many generations, however, when the darker side of their human nature began to emerge, Atlanteans became arrogant and cruel, and they fought wars to bring other nations under their power. Outraged at this evil behavior, the gods destroyed Atlantis in a single day and night, and sank it into the sea. Plato described Atlantis as great citadel surrounded by the sea, and that ring of water was itself ringed by land (the caldera wall), beyond which lay the great ocean. He claimed this story was based on an old Egyptian chronicle passed down through generations. A lot of people think Plato’s Atlantis is only a morality tale — more fiction than truth. 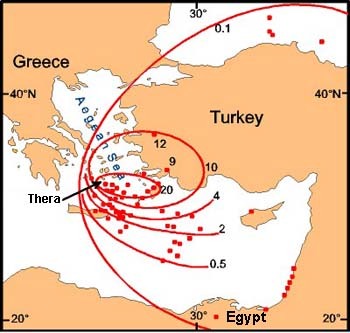 However, many serious investigators believe the source of the Atlantis legend is actually the Bronze Age eruption of Thera, an event that affected the entire Mediterranean region. As our ferry enters the Therean caldera, we begin to appreciate how one volcano could have such far-reaching effects. 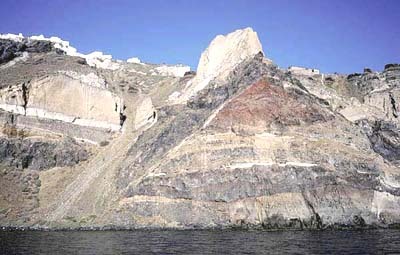 Even now, thousands of years later, the enormity of the blast is etched into cliffs that tower over the bay. We marvel at the alternating layers of black lava, red and white tuff layers and pale pumice exposed in the sea cliffs. Just as impressive is the manner in which people adapted to life on a volcano. 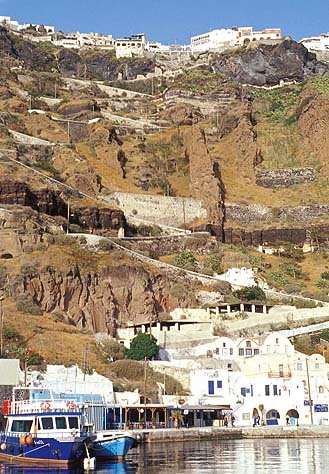 At the main port we look up to see the town of Fira hanging on the edge of the cliff. From the ferry terminal, the main route into the town is a tortuous path that winds up the face of the cliff. Many Therean towns seem to grow out of solid rock, which appears to be the foremost landform on this island. There is only a thin layer of soil, but what exists is a rich volcanic blend that grows excellent wine grapes, tomatoes and other vegetables. What is most obvious everywhere is volcanic debris. There are tephra hills, cliffs formed by lava flow and pumice, outcrops of colorful tuff, and powdery ash that billows up along country roads with the passage of every car. Almost everything about the landscape is vaguely extraterrestrial. For years, scientists have been studying the volcano to better understand its history and its potential threat in modern times. We learned more after contacting Dr. Tom Pfeiffer, a German volcanologist who conducts expeditions and tours to volcanoes around the world. He did research on the Bronze Age eruption of Kalliste and also the Roman (79 CE) eruption of Vesuvius in Italy. 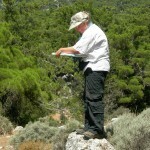 Dr. Pfeiffer explained that the pre-volcanic foundation of Thera is similar to that of neighboring Cycladic islands, which are made up of limestone and schist. We didn’t see any of those rock types, because they are visible only at a few locations around the island. What is most evident on Thera was created by plate tectonics, that is, large-scale movements of the Earth’s crust. Millions of years ago grinding of the African and Aegean plates resulted in immense pressure and heat, which produced lava and pyroclastic flows that welled up from the sea floor and enveloped the small original island. Recurring lava flows over many thousands of years built large dome-shaped volcanoes that periodically erupted and added successive layers to the island. 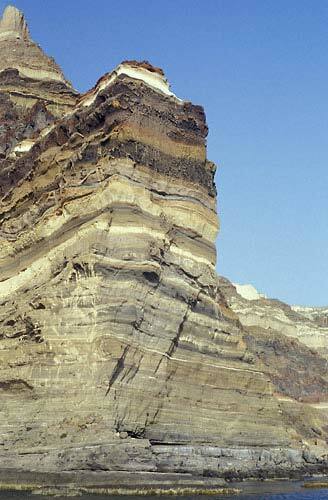 The cliffs of the caldera are striped with strata of lava, tuff and pumice: black, tan, rust, purple, white. Some of these layers are horizontal, others were thrust upwards and warped by colossal geological forces long before the beginning of history. People must have settled on the island when the volcano was rather inactive. In time they built a town on the volcanic dome itself and created a thriving civilization based on sea trade. All the while, the movement of tectonic plates beneath the sea probably caused tremors and earthquakes – but the populace must have become used to it. Even today, Greeks barely take notice of earthquakes unless pieces begin to fall off buildings. There must have been plenty of warning of the impending eruption – perhaps major earthquakes and venting of gases and ash from the volcano itself. Archaeologists believe the entire island was evacuated before the eruption. Excavations at Akrotiri, a city completely buried in volcanic ash, revealed no bodies – not one person trapped by the volcano. In fact, many houses looked as if the occupants had cleared out well ahead of the eruption, carrying away their most valuable possessions. 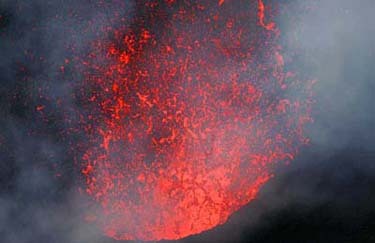 When the eruption finally happened, it was beyond comprehension. A team of Greek and U.S. researchers estimate that the eruption spewed 60 cubic kilometers (14 cubic miles) of dense rock equivalent (DRE) — six times more than the infamous 1883 eruption of Krakatoa. The research team found a ring of volcanic deposits extending about 30 kilometers (19 miles) in all directions around the island. The average thickness of these deposits is 30 meters (100 feet). During the eruption, the material that formed the deposits plunged into the sea as hot, fast-moving mixtures of gas, ash, and molten rock. Using computer simulations, scientists determined that the eruption would have generated a huge tsunami moving at 400 miles per hour. In addition, pyroclastic flows composed of pumice (a frothy rock so light it floats) would have created something called an “overwater flow” that could ride the giant wave. 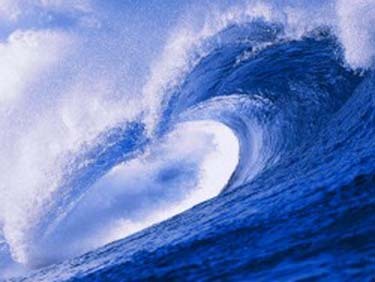 A giant tsunami moved towards Crete at 400 miles per hour. The island of Crete was hit hard by a massive wall of water and superheated debris. Traveling at jet speed, the tsunami took only 15 minutes to reach the heavily populated northern coast of Crete. There was no time to escape. Ships in harbors, towns, people, animals and crops — everything was swept away. Even those who lived in the great Minoan palaces at Knossos, Malia, Gournia and Zakros were caught up in the destruction. It was the end of an era for the Minoan Empire. The eruption was the worst environmental disaster that can be imagined. Astronomers living in Babylon wrote that planets and stars were obscured from view for nine months. Volcanic ash fell throughout the region, and it continued to drift around the world for years. Many areas around the Mediterranean Sea experienced crop failures that led to famine, which resulted in large migrations of hungry people seeking a better place to live. The devastation in the immediate area of the volcano was, of course, absolute. The cycle of eruptions went on for a long time after the first horrific eruption. There is evidence that a few people returned to Thera at some point to dig their possessions out of the ash covered town of Akrotiri. Who knows, these may have been looters willing to take a risk for a quick profit. However, the volcano continued to spew ash, which covered everything. In some places the ash is forty meters thick. 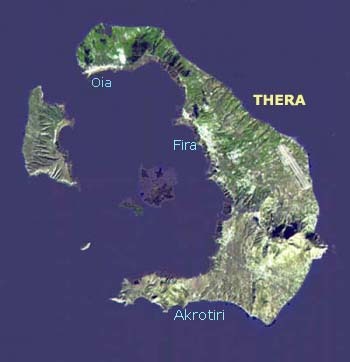 The island of Thera was not resettled for hundreds of years. Maybe the ash layer prevented agriculture, or perhaps people were afraid to set foot on a place the gods had destroyed.